Starting tomorrow, I will begin learning Tigrigna, the language spoken in the Tigray region. It is similar to Amharic and still uses the Ge’ez script instead of Roman characters for the alphabet…holla! According to my host family, “Tigrigna is hard. Amharic is easy.” I beg to differ, in that Amharic is extremely difficult, so we’ll see about this new language! I get to visit my site starting next Saturday, and will spend a week there, getting acquainted with the town and my host organization, which is the town health center. I’ll get to see my future house, and according to my site description on paper it’s a large room in a shared compound with my landlord’s family. Sounds kind of like a dorm room…My town does have a post office, so that’s rather riveting. During my site visit I get to set up my P.O. Box – meaning I’ll soon have a new mailing address. We had Sunday Funday in my town today, and a group of fellow PCTs from a nearby town came and we played American football, soccer and frisbee. I wore a pair of long athletic shorts and felt a bit scandalous, as I haven’t seen my knees in public in a month now! Unfortunately, the backs of my knees got sunburned :( It’s kind of entertaining to see the enormity of the crowd us farenji’s draw…people gawk and stare when you’re not doing anything, and even more so when you are doing something that’s watchable! After sport, we were all invited over to one of my classmate’s houses for lunch. We had typical Oromic (the region we’re currently in) cultural food (including injera! ), and it was actually one of the best meals I’ve had in Ethiopia. 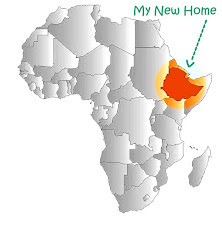 I am really looking forward to getting away for awhile…I can only eat so much firfir for breakfast…I’ve been reading my travel book about Addis and there’s quite a variety of restaurants (many serve pizza!!) and just a change of scenery/no full days of language classes will make for a nice break. After site visit, training will be halfway over – time seems to be passing quickly! I’ve already been gone for one month – but who’s counting?! I heard the Gators beat Georgia – and we’re still number one :) Happy November – I’ll let all you curious readers out there know how our counterpart workshop goes, as well as the big site visit!